Is your kid the King of Scary or the Queen of Creepy? Yeah, we know children like that. They sneak up behind us and scare the daylights out of us. They know all the creepiest facts, like how many bones are in the human body and how they’re all connected, and they love to share them with you. It’s enough to rattle your bones, isn’t it? The bright white, anatomically correct bones are printed on the front of the black skin suit for maximum creep factor. All your child has to do is hide in the dark with his or her back turned, then whip around and totally freak people out with the skeleton that appears. 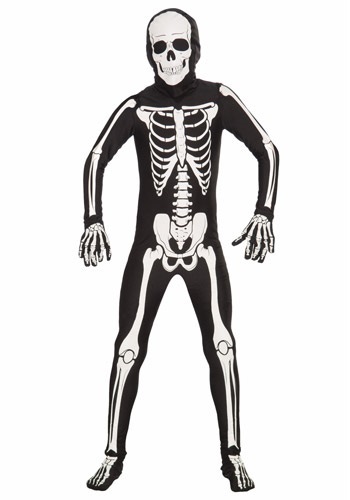 The suit covers right down to the finger tips and toes for a classic bone-only appearance. The cool hood has a mask with a super-spooky skull printed on it. But tell your kid be careful when he or she is out there scaring up a bunch of Halloween treats from the neighbors – the mask can obstruct vision so it shouldn’t be worn while walking or riding a bicycle on dark Halloween nights.